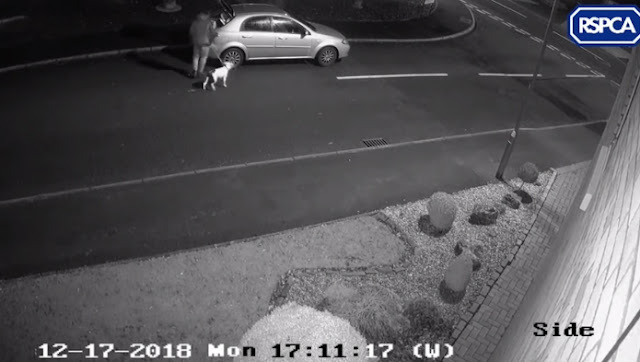 The RSPCA has released this heartbreaking footage of a man abandoning a dog from a car in Stoke-on-Trent. The CCTV, that was recorded at 5pm on Monday 17 December, is now forming part of an investigation. The Staffordshire bull terrier type dog was ditched by the side of the road at the corner of Timor Grove and Pacific Road. A man is seen leaving the passenger side of the car carrying a dog bed, and leading a white and black Staffordshire bull terrier type dog. The footage shows him cross the road, leaving the bed on the pavement and unclipping the dog’s lead, before running back to the car and driving away, whilst the distressed dog jumps up at the window and chases the care as it drives away. The dog was found sitting in the bed by a passer-by during the following hour. They took him to a local vets who called the RSPCA. RSPCA inspector Natalie Perehovsky is now appealing to the public for any information, she said: “The footage has to be seen to be believed, it’s just awful. "To see the poor dog in such obvious distress jumping up at the car as it drives away it just heartbreaking. "I can’t understand how someone could do this. “The vets scanned his microchip and we have traced two previous owners in the Birmingham area, but do not believe either are the current owners, and therefore not those responsible for abandoning the dog. “One man can be seen clearly in the footage dumping the dog, and there is a second person in the driver seat of the car. 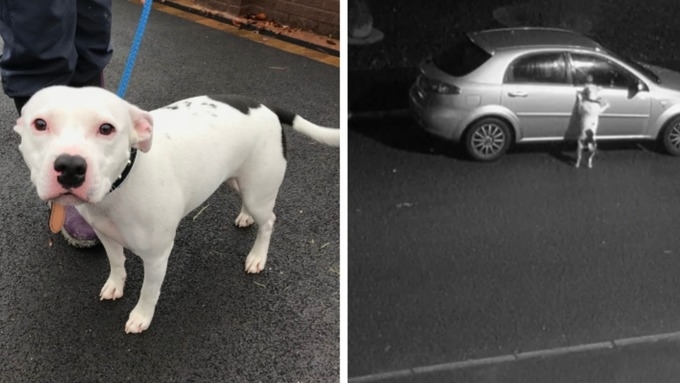 "I am very keen to hear from anyone who recognises the vehicle, the man or the dog. “The veterinary staff have nicknamed the dog Snoop, and he is in good condition, thought to be two years old. "He is a white Staffie with black marking, and is such a friendly, lovely boy. "He’s currently being cared for at a private boarding kennels where he will get all the care he needs whilst I investigate further." The RSPCA expect more than 10,000 animals to be taken into our care this winter. Last year, the animal welfare charity’s 24-hour cruelty hotline received 55,821 calls over Christmas. Responses to "Dog doesn’t realize he is being abandoned, desperately tries to get back in car"
Put the owner in jail. Law should allow for the public to take revenge on those who mistreat animals. Well at least oone of them is responsible for giving or selling the pup to the abuser: EQUALLY GUILTY. I would like to see five big guys with dog masks and baseball bats, appearing on the owners door :"Your dog sent us". Good, the poor dog deserves much better than these sick fucks! I hope they burn in hell! Please keep posting updates about this dog. This is f'n sad; I hate just leaving my dogs at home when I have to go somewhere that they can not go. There does need to be harsh punishment for these A-holes and others like them. Unfortunately our laws are weak at best in this regard.